During an argument with his girlfriend, a Florida Man allegedly threw a piece of fried chicken at the woman, striking her in the face with the poultry and triggering his arrest for domestic battery, cops report. 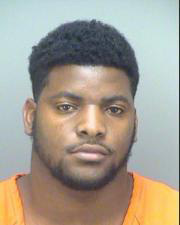 Juwan Brown, 23, was busted Wednesday evening after a dispute with his live-in girlfriend turned violent in the couple’s St. Petersburg home. After the 6’ 2”, 220-pound Brown stepped on the woman's foot, he “threw a piece of chicken at the victim, striking her in the left side of her face and glasses,” according to a criminal complaint. Brown, pictured above, was subsequently arrested by a sheriff’s deputy and booked into the county jail. Free on $5000 bond, Brown has been ordered by a judge to have no contact with the victim. Court records show that Brown was arrested in 2015 for striking the same woman (who was pregnant at the time). Before pleading no contest to a battery charge, Brown violated the terms of his pretrial release by calling and visiting the victim’s residence, despite a no contact order being in place. Last year, Brown entered a no contest plea for failing to attend counseling sessions and pay fines that were ordered by a judge in the battery case.